Ash Bennett told me about A race frame in Italy, i colecterbility the seller but he did not speak English. I contact Alisandro Who owns the ex Robert Dunlop nrs. and he actually as translator and intermidiery as the seller did not want to post abroard. Alisandro kindly brought the frame to stafford for me. The fame ended up at Verlicchi the italian frame makers noone nows why it ended up there. However its a 1988 Spondon Norton Rc588 ex works race frame made for A water coold engine. IT was the 4TH frame made for the team by spondon. While wanting for the frame to arived i noticed a 1979 Eurolantic program for sale its from good Friday at Brands. On the front cover is a 89rcw with the same stickers used on the 1988 forks, on the inside a broarside photo of the same bike, catogorycly a Rc588 with twin shock, water coold engine and 89 rcw bodywork. I purchased the program hoping for better quality photos. 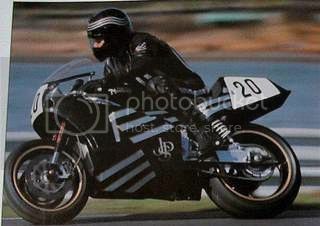 It got me thinking what about A subframe and swinging arm, I had purchase of Graham a twinshock Spondon subframe with Brian Crighton had told me was very early jps. 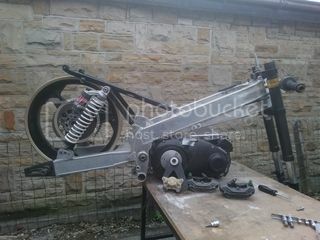 And of Ash a 89 twinshock swinging arm and rear wheel. The sub frame would not fit my other two race frames so I Thought it would not fit this frame. I was amazed to find the subframe fits this race frame the picture above shows it loosly assembly, not in the photo is the radiators, front wheel and rev counter.